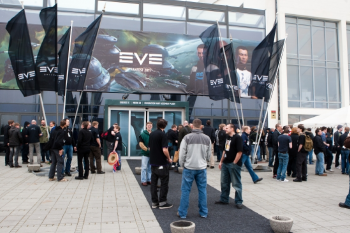 CCP is investigating an Eve Online FanFest panel for sharing a severely depressed player's contact info, then encouraging others to harass him until he killed himself. During this year's Eve FanFest (think BlizzCon for World of Warcraft) one of the convention's panels stands accused of publicly mocking a player who'd privately expressed suicidal thoughts to another player in game. According to Eve Online player Kestrel, who attended the event, the communication was shown for laughs during a public presentation, and featured numerous comments made by a player who showed what he called "obvious" signs of severe depression. Making matters worse, the presentation was actually delivered by one of the CSM council members (a publicly-elected group that acts as an official go-between for the players and the game's developer, CCP) and reportedly attended by representatives of CCP itself. "When this communication was shown to the audience, the presenter, along with part of the audience of players and CCP representatives present all had a good laugh," Kestrel said. "The presenter went on to encourage other players of Eve Online to harass this player in the hope that he would eventually be compelled to act on his suicidal thoughts. This player's in-game contact information was provided. I found this section of the presentation to be in extremely poor taste." CCP, it seems, is taking the matter much more seriously than its representatives in attendance, quickly issuing a statement that condemns the panel's bullying, while promising to protect the player named during the presentation. "I want to reassure you that CCP in no way condones the harassment of players, especially those who suffer from depression or suicidal thoughts," said CCP PR rep Ned Coker, "as we understand the possible consequences of such abhorrent behaviour. "Furthermore," he continued, "we have a suicide hotline protocol which has, in specific cases, made a difference for several unfortunately troubled players. We appreciate you voicing your concerns on this level, and CCP will be very vigilant in monitoring any behaviour directed towards the individual named in the presentation. "We are undertaking a full internal review of this panel as well as the process used for vetting the panel's materials. Even though this panel was billed as unfiltered by CCP, we expect public presentations to be courteous and professional towards others."